We have an important question for you. Why would you ever play a board game WITHOUT a Deadpool theme to it? Deadpool is the Merc with a Mouth. He’s the best comic book ever created and most people don’t know this about him, but he’s a huge fan of board games… especially ones that feature him on them! The good news is that this Marvel Deadpool Edition Monopoly Board Game has heavy Deadpool themes, so you never have to play a normal game of Monopoly ever again. 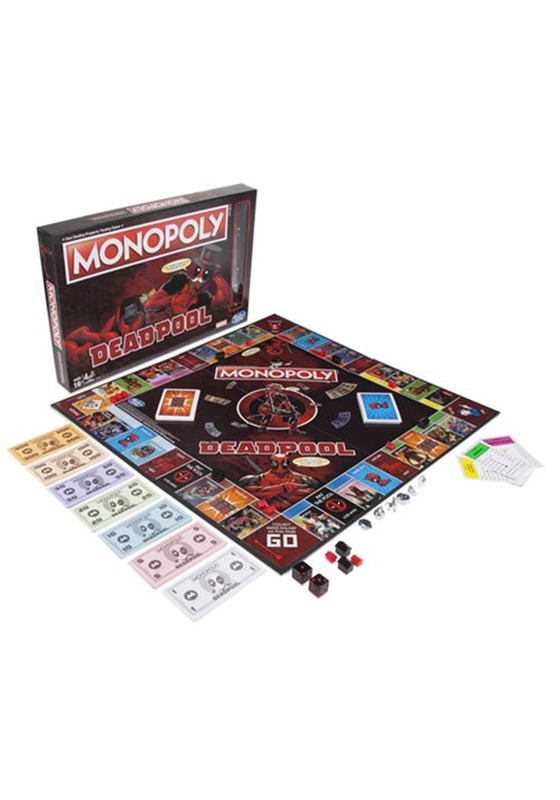 This USAopoly game comes with everything you need to play a Deadpool inspired game of Monopoly. It has game pieces inspired by Wade’ favorite things, including his signature symbol, a taco, a bomb, and more. The game board is chock full of references to the comics, including wacky spaces like Dogpool and Maid Deadpool. It also comes with themed money and cards to top it all off. Gameplay is that of classic Monopoly, where you’ll be auctioning real estate and building up your Deadpool empire. It also has a few new rules to add to the mix to make it feel more chaotic. There are ways to steal money and properties from other players, adding a new element to the mix.